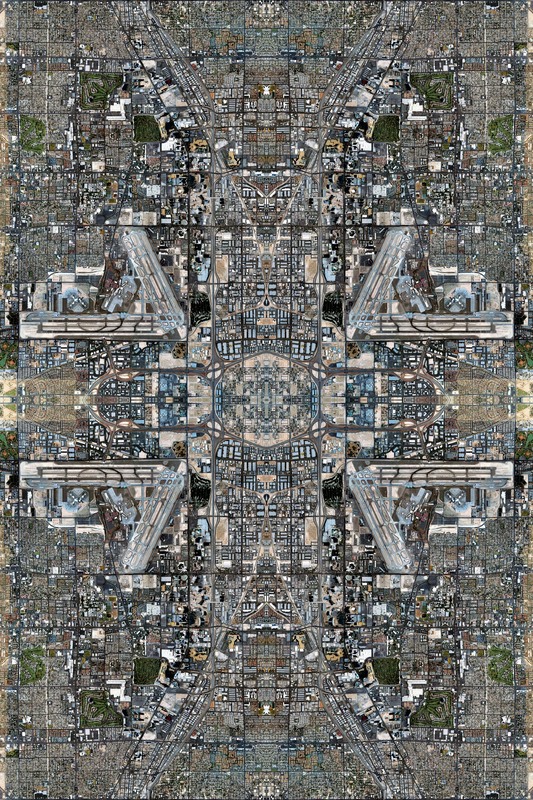 David Thomas Smith’s works are compositions of thousands of digital files drawn from aerial views taken from internet satellite images, this work reflects upon the complex structures that make up the centres of global capitalism, transforming the aerial landscapes of sites associated with industries such as oil, precious metals, consumer culture information and excess. Thousands of seemingly insignificant coded pieces of information are sown together like knots in a rug to reveal a grander spectacle. Questions of photographic and economic realities are further complicated through the formal use of patterns that have their origins in the ancient civilizations of Persia. This work draws upon the patterns and motifs used by Persian rug makers, especially the way Afghani weavers use the rug to record their experiences more literally with vivid images of the war torn land that surrounds them. This collision between the old and the new, fact and fiction, surveillance and invisibility, is part of a strategy to reflect on the global order of things. 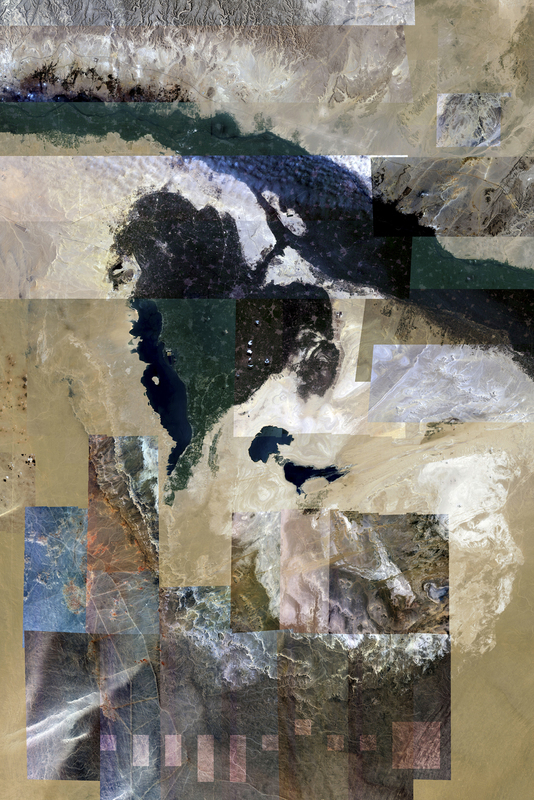 ANTHROPOCENE: ‘The term Anthropocene suggests that the Earth is now moving out of its current geological epoch, called the Holocene and that human activity is largely responsible for this exit from the Holocene, that is, that humankind has become a global geological force in its own right.’ – Paul Crutzen Composited from thousands of digital files drawn from aerial views taken from internet satellite images, this work reflects upon the complex structures that make up the centres of global capitalism, transforming the aerial landscapes of sites associated with industries such as oil, precious metals, consumer culture information and excess. Thousands of seemingly insignificant coded pieces of information are sown together like knots in a rug to reveal a grander spectacle. Questions of photographic and economic realities are further complicated through the formal use of patterns that have their origins in the ancient civilizations of Persia. This work draws upon the patterns and motifs used by Persian rug makers, especially the way Afghani weavers use the rug to record their experiences more literally with vivid images of the war torn land that surrounds them. This collision between the old and the new, fact and fiction, surveillance and invisibility, is part of a strategy to reflect on the global order of things. Exploration is deeply ingrained in the make up of human kind. Our struggle is that of contact. The Arecibo message was broadcast into space with the aim of reaching out to extraterrestrial life. The message was broadcast into space via frequency modulated radio waves at a ceremony to mark the remodeling of the Arecibo radio telescope on 16 November 1974. David Thomas Smith is a Dublin based, Irish artist who is a graduate of the University of Wales, Newport, where he obtained a (BA Hons) in Documentary Photography. Smith’s works have been exhibited internationally, they have also appeared in a diverse number of publications from Esquire, Wired and The Huffington Post. Smith’s work was recently featured in Robert Shore’s Post-Photography: The Artist with a Camera. Smith is continuously developing his photographic practice and pushing the boundaries of his medium.